GCCButanol is a four carbon alcohol which possesses much superior properties over ethanol for burning in modern gasoline engines, or for combining with diesel in modern diesel engines. Cobalt Technologies is partnering with American Process Inc. to build an industrial sized bio-butanol plant. 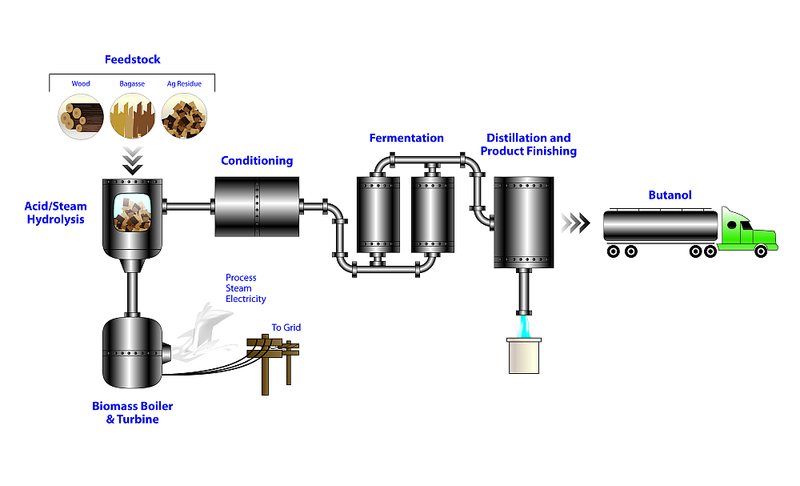 In addition, the partners are joining with Green Power + to include a clever carbohyydrate extraction system and alcohol processing module to a biomass power generation system (see image below). Under the agreement, Cobalt Technologies and American Process will integrate Cobalt’s patent-pending continuous fermentation and distillation technology into American Process’s Alpena Biorefinery, currently under construction in Alpena, Michigan. Slated to begin ethanol production in early 2012 with a switch to biobutanol in mid-2012, the API Alpena Biorefinery will produce 470,000 gallons of biobutanol annually, which will be pre-sold to chemical industry partners. Funded in part by an $18-million US Department of Energy (DOE) grant and a $4-million grant from the State of Michigan, the API Alpena Biorefinery will demonstrate the conversion of hemicelluloses extracted from woody biomass to fermentable sugars that can be used for production of ethanol. Meanwhile, Cobalt’s technology will demonstrate that these sugars can also produce butanol. Greenpower+. 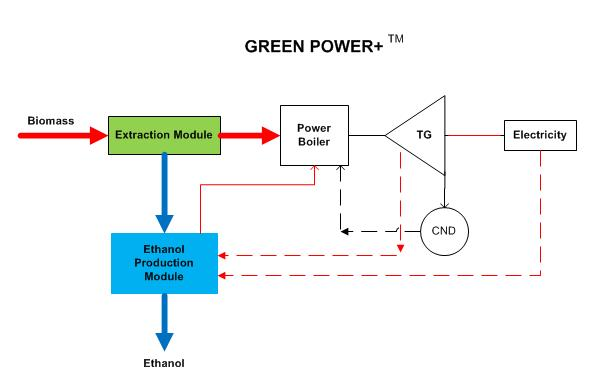 GreenPower+ utilizes a module in front of the biomass boiler that utilizes steam extract hydrolyzate as feedstock and an ethanol extraction module. Dewatered solids are then returned to the biomass boiler. The process significantly increases overall profitability by converting low BTU hemicelluloses into high-value ethanol. The process enables cost-effective cellulosic ethanol production at a small scale of 10-20MMUSG/year, with an ethanol production cost of around $1/gallon US, API says. GCCAs you can see, by combining cellulosic power and heat generation with cellulosic alcohols production, a company is able to increase revenue streams while providing its own process heat and electric power. More on Rossi / Focardi LENR / "Cold Fusion"
Can Small Modular Nuclear Reactors Save America?